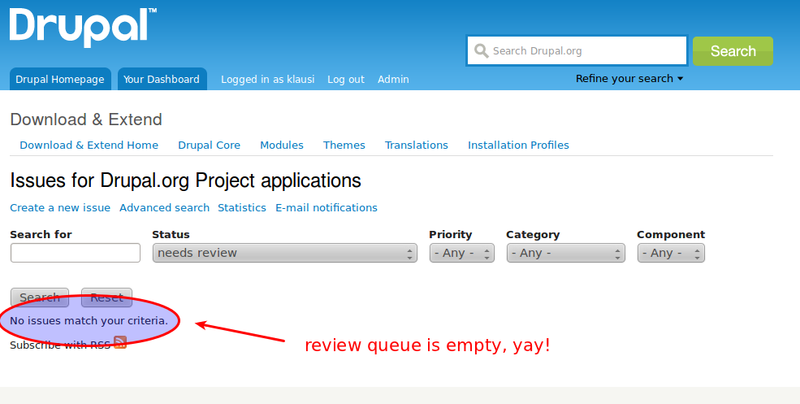 This is a happy day: the issues needing review count is down to zero at this moment in the Drupal project application issue queue. I have attached a screenshot as proof. I started my involvement with project applications a few weeks ago, where we had 250 open issues needing review. I saw it as a challenge to bring this number down radically and invested some hours pursuing it. I even got into community spotlight for this effort, which would not have been possible without the mentorship and support of many people. I want to thank greggles, sreynen, jthorson, ELC and all others that helped to resolve this 250 issue backlog and supported me in my addiction. Keep up the good work! An honor to serve the same group (fsinf) as you did (and still do).